I’ve had some recent posts about mistakes I’ve committed while hiking/cycling. My hope is that, in posting these, y’all will learn from my lessons learned. The last century ride I did was about 11 years ago. I ended up getting pretty severe heat exhaustion, but, even with that, I can remember thorougly enjoying that 110 mile ride from Orland Park, IL to Valparaiso, IN. Today, I set out to get in 100 miles by taking the Coast Route from Carpinteria to Ventura and then the Ojai Valley trail up to Ojai… and then back. I’ll save you the suspense and let you know that it didn’t happen. I set out at 1045 a.m. The conditions were nice – 64 and sunny with a light breeze – and the ride to Ventura was pretty uneventful yet scenic. This leg of the Coast Route goes along the 101 and a bunch of beautiful little beaches. Finally, after reaching and passing through Emma State Beach, I reached my turnoff for the Ojai Valley Trail, which is at the intersection of 33 and Main Street. I passed through an industrial corridor but, again, it was pretty enjoyable riding. Just as I was thinking about how easy and smooth the ride was – at about 1/3 of the way to Oak View – I got that dreaded feeling that cyclists hate. I felt an increasingly crunchy sensation coming from my back wheel. Stupid flat tires. But this is why I carry a seat bag with 3 Co2 cartridges, a C02 gun, and a spare tube. I found a piece of glass wedged into the tread of my Gatorskin tire and yanked that out. I changed my tube within a couple minutes and attempted to inflate the new tube. Pinch flat. Dangit. And I’d just given away my patch kit recently…so I had nothing left to fix this darned tire. Fortunately, I met my new friend, Cliff. Cliff was a fellow rider who was riding solo on his road bike. He stopped and offered help. We tried to use a spare tube he’d brought with but alas, we ended up using my remaining Co2’s to find out that his tube also had a puncture. Fortunately, Cliff also had a patch kit. He helped me patch my tube and we pumped it up as much as we could with his low pressure pump. It probably got up to 60-70 psi (110-120 is optimal for my tires and would help with the risk of getting another flat)… but beggars can’t be choosers. Cliff took his pump back and continued heading towards Ojai. I, on the other hand, decided to wave the white flag towards my century ride aspirations for the day and to ride the 10 miles back to Ventura to a bike shop I’d passed at the trail head to get a new tube. After a mile of riding, I, again, had a flat. Seriously. The valve on this tube was kind of bent and I think the air was leaking out. I walked my bike for a mile and a half until my friend Cliff caught up with me on his return leg. He gave me his pump again, I pumped up the tube, and I rode as quick as I could back, knowing my tube had limited air. Literally, 200 feet from the bike shop, I once again was riding on my rim. Good timing. I got a couple tubes, made some small talk, fixed up my tire, and headed on my way. For what its worth, Jim and Celeste at the bike store on Olive and Main Street in Ventura are awesome and they have a cool little shop. Check em out sometime. I began the trek home, only to find that the temps had risen to close to 100 degrees and the winds had kicked up to 30 mile an hour headwinds. If you do the math, that equates to about 45 mph winds when I’m riding 15 mph. GRR. At the same time, it’s hard to be angry riding in this kind of beautiful area. 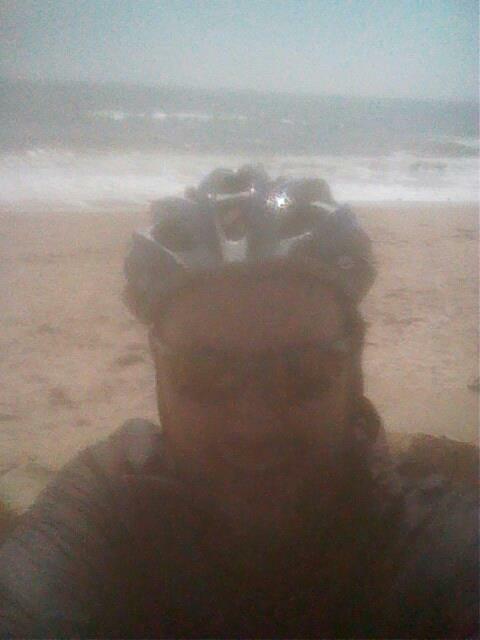 I pushed past Emma State Beach, Fairia Beach, Solano, and to the RV campground. Here, I really needed a psychological break, so I took a second and chilled out on the beach. I treated myself to a Honey Stinger Waffle here. MMMM. And then it was time to fight those headwinds again. Boy I was tired here. I pushed on and on and on, striving to maintain 15mph. Its weird how mental fatigue can affect one’s physical state. 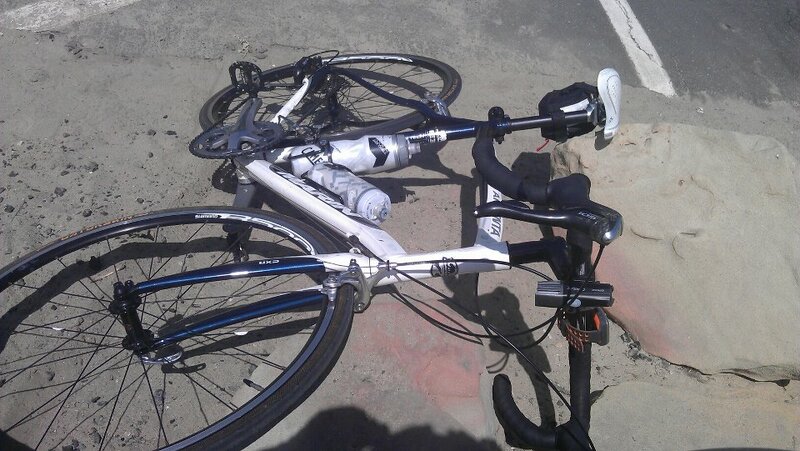 At about 4 miles left, I was riding along the 101 and came upon another rider who was in the same situation I was in. I was his Cliff and helped him to get back up and running. It’s funny how things like that work out. I trudged on and got home to find 6 dry ice-packed Chicago Style Pizzas from Chicago. Thanks mom! Calories consumed: 500 – Honey Stinger Waffle, Honey Stinger chews, HEED/Perpetuem drink. Posted on July 10, 2012, in cycling and tagged carpinteria, coast route, coastal route, flat tire, ojai, ojai valley trail, ventura, ventura river trail. Bookmark the permalink. Leave a comment.